Concentric Pumps Ltd. has developed an oil pump with double the original capacity for the new XtraShift transmission fitted in McCormick's high-rated CX Series tractors. The oil pump is designed to cope with the increased performance and torque capacity for which the XtraShift transmission has been designed. The pump is a robust, compact design with a sintered metal rotor and plastic filter. The increased capacity has been achieved by maximizing the rotor geometry and modifying the inlet to cope with the increased flow. There are four tractors in the CX Series all powered by four-cylinder Perkins engines and ranging from 54kW/73hp to 75kW/102hp output. 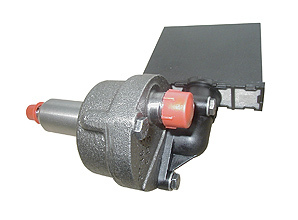 The XtraShift transmission offers power shuttle for clutchless shifts between forward and reverse and a greater choice of speeds- 24 x 24 as standard or 36 x 36 with creep. The unit's three powershift speeds help to improve field performance and drivability, while the wet clutch design has been shown to reduce service and maintenance requirements. Concentric Pumps Limited is a subsidiary of Concentric plc, a major supplier to the world's, truck, agricultural and construction equipment industries with plants in the UK, USA and India. In addition to oil, fuel transfer and water pumps for diesel engines, the group also manufactures cooling fans and associated equipment, as well as fuel lubrication pumps for transmissions and compressors.